Book Giveaway: $1,000 Dollars & An Idea - Entrepreneur To Billionaire. Book Giveaway: $1,000 Dollars & An Idea – Entrepreneur To Billionaire. THIS CONTEST HAS ENDED. 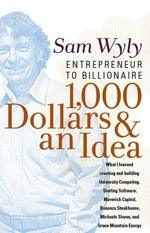 This month’s giveaway is for a copy of “$1,000 Dollars & An Idea” by Sam Wyly. Mr. Wyly wrote this book to tell readers what he learned while starting all his various companies – University Computing, Maverick Capital, Michaels Stores and Green Mountain Energy. Obviously, he has been rather successful, no? The title of the book stems from the fact that he took $1,000 of his savings to start University Computing, took it public two years later, and became a millionaire at just 30 years old. If you should be reading about anyone starting with nothing and growing a business into something this big, it is definitely Mr. Wyly. Without sounding like an egotistical businessman, he talks a lot about exactly what it takes to start and grow very successful businesses, which is great for people like me working to get their own things going. It’s a great combination of both a story and advice and makes for a pretty interesting read. The most important thing to take away from this book? Have confidence in yourself, as you will never succeed if you don’t. If you are struggling to start a business or need some encouragement along the way, you should check out this book. Everyone who is subscribed by RSS feed or Email subscription will see a code word(s) inside the feed or email that you need to email me to enter. If you don’t already have my email address, my contact form is right here. The giveaway closes at 10:00PM MST on Monday, November 10th 2008, so email me that code before then. Contest open only to residents of the US, and I will ship the book via media mail USPS. The winner of the book will be announced on Wednesday the 12th. Good luck! THIS CONTEST HAS ENDED. Sign… I am not living in US. By the way, I don’t see any code words inside the feed. I also do not see a code anywhere. It looks like an interesting book. The opportunity to enter a drawing to win it is very nice. How unfortunate that the necessary code is not present. Debra, it is there as I have gotten 22 entries so far. It is inside the feed.